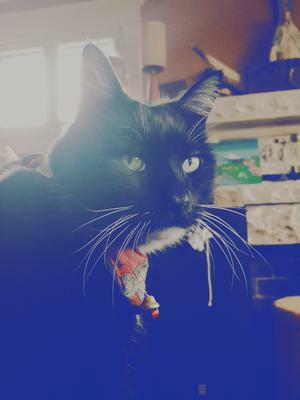 Gunther, my handsome Tuxedo cat, and I found each other 14.5 years ago when I was visiting my friend's school at Crenshaw High School in 2002. He had been living in the school's garden for a couple of months, since my friend found him as a kitten (maybe 2-3 months old? ), injured and alone and brought him to her school. I was not a cat person at all before meeting this sweet, lethargic kitten I later named Gunther. But something about him told me that we belonged to each other. Gunther is almost 15 years old and is still very much the vocal furbaby he was when I first got him. I have since become a cat lady in training and adore cats now, to the point where I am fluent in cat as a language, haha. He has inspired my love for cats and to help other cats via rescuing and fostering.